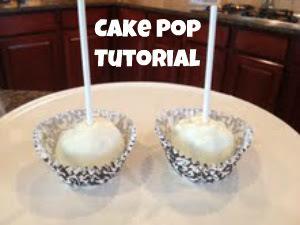 I thought it would be a fun idea to go through step by step on how to make cake pops. I used chocolate cake, chocolate frosting and Wilton vanilla chocolate. I left them plain and white so you can picture what you would like to do with them. You can dye the chocolate a different color, add sprinkles, thin piping, different shapes, ribbon, or fondant accents. The options are all up to you! Send me a picture of your cake pops! I would love to see what you did with them!! Thanks for this- I tried to make them at Christmas and well- it was a disaster! They didn't get very hard! But hey- they did taste great!! Have a great day and keep these awesome tutorials coming!! You could probably do that! I bet it would save some time and hassle! The only thing it would be missing is the frosting that you mix in with the cake which makes it very moist and a great flavor :) if you try it let me know how it works!